Lancashire UK: Recent x-ray style examinations of a book found at a Burnley bus stop found some intriguing predictions. Prof James Donaughy of Carlisle University had been carrying out x-ray style inspections of the said book. The theory of these revelations is that years ago, when writers were on an extreme budget, they would often rub out their original works and write over them with newer versions but leaving the indentations of their original work behind. 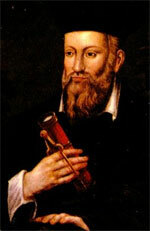 Prof Donaughy explained - "These are startling revelations made by Nostradamus. Having examined these works, I can reveal that underneath the later writing, Nostradamus had indeed made some quite amazing predictions. First we have a prediction that next Tuesday a man will fall over near a park in Chorley. Secondly we have an amazing prediction that due to high winds, a childs kite will get stuck in a tree in December. Thirdly a lady will drop her shopping outside Tescos in Blackburn in 2009 and lastly that a blue team from Manchester will win the premier league. The Professor continued - "The first three predictions I can quite believe, but the last one, now that's just plain silly"